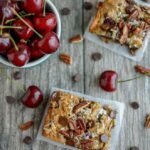 These Cherry Oat Bars are the perfect addition to breakfast on a busy weekday morning or for serving as a kid-friendly after school snack! They’re lightly sweetened and full of fiber and protein. In a large bowl, combine oil, maple syrup, peanut butter, eggs, yogurt and vanilla extract and stir until well combined. Add chopped sweet cherries, oats, flour, baking soda and 1/4 cup chocolate chips and stir until just combined. Press into a 9×9 pan lined with parchment paper. Top with remaining chocolate chips, pecans and coconut if using. Feel free to throw in some extra sweet cherries if you want! You could also use 1/3 cup maple syrup if desired. Although I haven’t tried it, you could likely spread these into a 9×13 pan instead of 9×9 for a bit thinner bar.